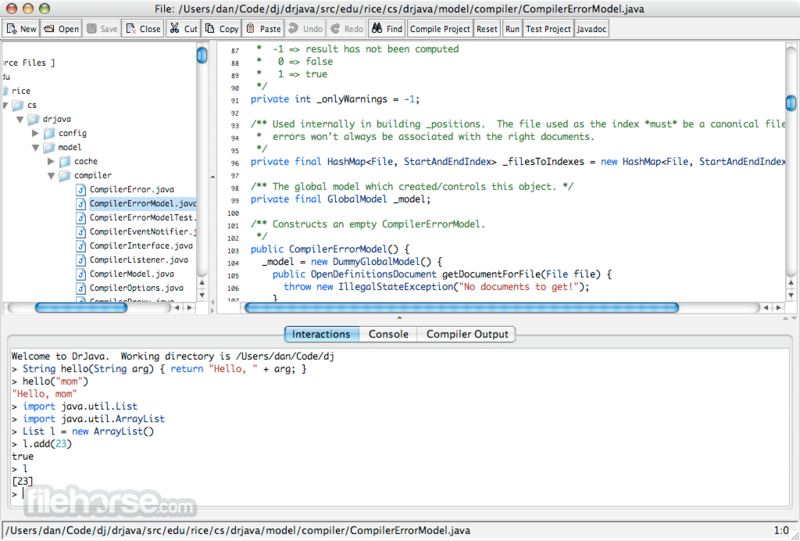 DrJava for Mac is a lightweight development environment for writing Java programs. It is designed primarily for students, providing an intuitive interface and the ability to interactively evaluate Java code. It also includes powerful features for more advanced users. DrJava is available for free under the BSD License, and it is under active development by the JavaPLT group at Rice University. DrJava requires a Java 2 v1.4 or later virtual machine. (Note: The JDK, not the JRE, must be installed to have access to compilation in DrJava.) If you need to download a JVM, we recommend Sun's JDK 5.0 for Solaris, Linux and Windows. Other users should use the Java virtual machine that comes with their operating system (including MacOS X). Also, DrJava for Mac uses two Java Virtual Machines (one for the main program, and one for the Interactions Pane) that use Java's Remote Method Invocation (RMI) to communicate with each other. RMI uses TCP/IP as the default transport mechanism, so you must have those drivers installed. Without TCP/IP, DrJava will not start properly.